Sir Edward Clarke--May it please you, my lord, gentlemen of the jury--Having in my mind the observations which, under some stress of feeling I made in the early part of the day, I may state at the outset that I recognize the admirable fairness with which the Solicitor-General cross-examined Mr. Wilde. And if earlier in the day I was moved, by what I am glad to think I then described as the momentary forgetfulness of my learned friend yesterday, to expressions which sounded hostile in regard to him, he will let me say at once, in the frankest manner, that the way in which he has cross-examined absolutely destroys any suggestion which might have lain in my words. . . . 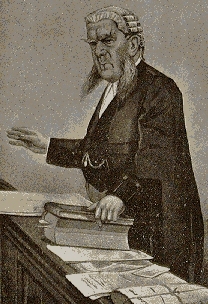 I suggest to you, gentlemen, that your duty is simple and clear and that when you find a man who is assailed by tainted evidence entering the witness-box, and for a third time giving a clear, coherent and lucid account of the transactions, such as that which the accused has given to-day, I venture to say that that man is entitled to be believed against a horde of blackmailers such as you have seen. . . . this matter. I know not on what grounds the course has been taken. . . . This trial seems to be operating as an act of indemnity for all the blackmailers in London. Wood and Parker, in giving evidence, have established for themselves a sort of statute of limitations. In testifying on behalf of the Crown they have secured immunity for past rogueries and indecencies. It is on the evidence of Parker and Wood that you are asked to condemn Mr. Wilde. And, Mr. Wilde knew nothing of the characters of these men. They were introduced to him, and it was his love of admiration that caused him to be in their society. The positions should really be changed. It is these men who ought to be the accused, not the accusers. It is true that Charles Parker and Wood never made any charge against Mr. Wilde before the plea of justification in the libel case was put in--but what a powerful piece of evidence that is in favour of Mr. Wilde! For if Charles Parker and Wood thought they had material for making a charge against Mr. Wilde before that date, do you not think, gentlemen, they would have made it? Do you think that they would have remained year after year without trying to get something from him? But Charles Parker and Wood previously made no charge against Mr. Wilde, nor did they attempt to get money from him, and that circumstance is one among other cogent proofs to be found in the case that there is no truth whatever in the accusations against Mr. Wilde. . . .
You must not act upon suspicion or prejudice, but upon an examination of the facts, gentlemen, and on the facts, I respectfully urge that Mr. Wilde is entitled to claim from you a verdict of acquittal. If on an examination of the evidence you, therefore, feel it your duty to say that the charges against the prisoner have not been proved, then I am sure that you will be glad that the brilliant promise which has been clouded by these accusations, and the bright reputation which was so nearly quenched in the torrent of prejudice which a few weeks ago was sweeping through the press, have been saved by your verdict from absolute ruin; and that it leaves him, a distinguished man of letters and a brilliant Irishman, to live among us a life of honour and repute, and to give in the maturity of his genius gifts to our literature, of which he has given only the, promise in his early youth.